Think about your daily shower routine. Do you apply hair products first and then cleanse your skin? Or do you tackle your face first and then your hair last? The key to a successful shower is to cleanse your hair first, then your body, and save your face for last. Note that removing makeup comes right before cleansing your face (if you wear makeup). Below are a few reasons why you should cleanse your skin last in the shower. This will help prevents breakouts. Think about it — during your shower, you use a variety of products including shampoo, conditioner soap, body wash, and then your facial products. If you cleanse your skin first and then follow up with a sticky hair product, some of that can get on your skin as you wash. 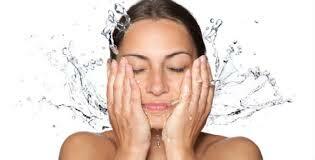 This buildup essentially negates the cleansing you just did to your skin and can linger and cause breakouts. This goes for your face, but also your back (this is a common culprit of “bacne”). Your pores will be open near the end of your shower. Deep cleaning the pores becomes easier and more efficient since your skin has been exposed to warm water for a few minutes. The shower’s steam helps open up your pores and liquefies the buildup of sebum trapped in your pores.